For a quarter century, Atlantic General Hospital has been serving the residents of Ocean City and surrounding communities in Maryland and Southern Delaware. In keeping with a new vision for healthcare in today’s environment, AGH is fostering healthy lifestyles and preventive health, not just providing hospitalization and outpatient medical treatment. 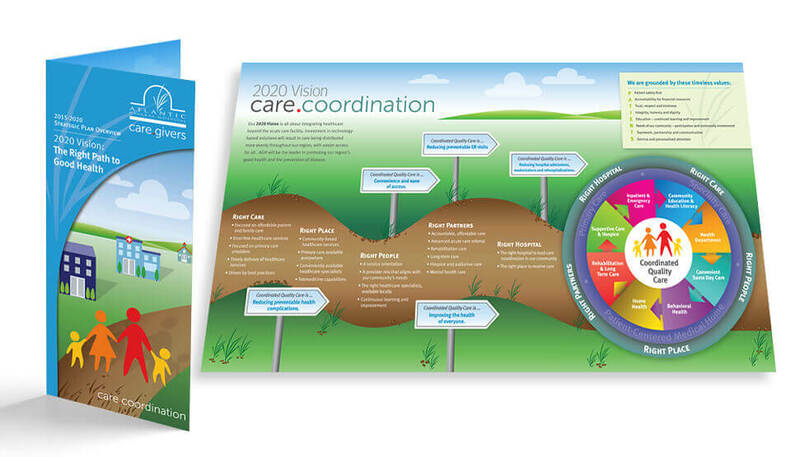 AGHs’ new 2020 Vision five-year strategic plan and promotion is all about integrating healthcare beyond the acute care facility, offering easier access to all via investment in technology-based care delivery. It boils down to five “rights” — right care … right place … right people … right partners … and right hospital — that AGH is committed to delivering and that are addressed in the five-year plan. We created a breast-pocket summary that distills the 40-page plan to its essence, using colorful infographics to tell the story. The piece is being used to educate and inform community leaders and the general public about the exciting new initiatives that are planned. We also produced a 30-sec. commercial that introduces 2020 Vision to the community via broadcast TV and cable spots run in the local market.